Last December, the news was 'Inconvenient Truth 2' being released next year. It's now "next year," so the news is How Donald Trump Made ‘An Inconvenient Sequel’ 10 Times More Relevant. [H]ow could his follow-up bulletin of a climate-change doc, “An Inconvenient Sequel: Truth to Power,” coming out eleven years later, possibly have a comparable impact? If you’d asked me a year ago, I would have said: It couldn’t. I would have said that Gore’s relevance as a herald of looming environmental disaster had been diminished by his own success. He no longer owned the issue, because we all did. And that would be a good thing! But when you see “An Inconvenient Sequel,” which played at the Sundance Film Festival in January and opened yesterday, to promisingly huge numbers, in limited release (it goes wider next weekend), the film takes on a radical urgency that even Al Gore probably didn’t plan on. In a way that neither Gore nor the film’s co-directors, Bonni Cohen and Jon Shenk, could have anticipated, “An Inconvenient Sequel” makes the case for climate change as a fundamental political/economic/moral issue of the 21st century in a way that shoves it right through the teeth of Donald Trump’s destructive ignorance. If Hillary Clinton were now president, the film’s politics would be more or less congruent with that of her administration. Instead, “An Inconvenient Sequel” plays as a bolder statement: a movie that might have been designed to answer the current rollback of environmental policy — and to address America’s backing out of the Paris Climate Accord, since the film documents, with fascinating on-site political detail, how, exactly, that accord was reached in 2016 (complete with participation from Chinese president Xi Jinping and Trump’s BFF Vladimir Putin). The pulling out of the Accord was, of course, another case of macho semiotics on Trump’s part: “I’m not going to go to your girly-man Euro garden party. Too regulated!” But since the President of the United States is now a captive of magical thinking on the environment (his plan to take America back to the glory days of coal mining makes about as much sense as returning to the gold standard), we are once again in dire need of a crossover documentary that can demonstrate what the stakes are. And “An Inconvenient Sequel” does just that. The force of Trump turns this movie into an impassioned answer to the force of Trump. Trump even opens the trailer, which I probably should have posted in April, when it came out. 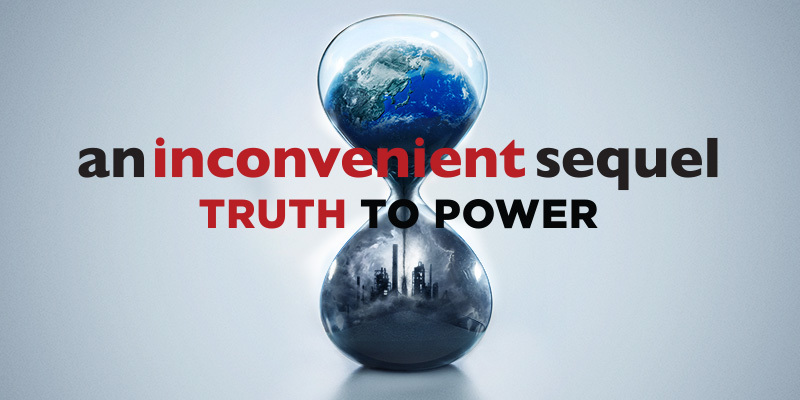 Watch the new trailer for An Inconvenient Sequel: Truth to Power, the sequel to An Inconvenient Truth. In theatres July 28, 2017. That's not all for promotion of the documentary. Al Gore and One Republic, which plays the theme song to the movie, have been busy making the rounds of late night talk shows the past month as well. Follow over the jump for clips from Stephen Colbert, James Corden, and Seth Meyers. I begin with the earliest clip, Al Gore Received Illegal Campaign Materials In 2000 (And Reported It) from The Late Show with Stephen Colbert. The 45th Vice President and 'An Inconvenient Sequel' documentarian Al Gore once found himself at a moral crossroads eerily similar to Donald Trump Jr.'s. Colbert returned to this interview last week in Get A Hot Date With Al Gore's Climate Change Pick-up Lines. Gore showed up on James Corden's show, where he took on Donald Trump's latest tweets & takes. James asks former Vice President Al Gore about President Donald Trump's moves to break down much of the previous administration's accomplishments, and the two discuss the 9-minute gap between tweets announcing transgender individuals are no longer eligible to serve in the military. Gore was not alone in promoting the film. The band OneRepublic sang the title song on Seth Meyers' show. Musical guest OneRepublic performs "Truth to Power" for Late Night with Seth Meyers. When I first saw this, I thought "the band's name alone is perfect for this song." Whether they will have the same success with it as Melissa Etheridge, whose song for "Inconvenient Truth," "I Need to Wake up" won an Oscar, remains to be seen. I wish them and Vice President Gore luck with this film. If it's good enough, I will be showing it to my students next year. Speaking of success, Colbert, Corden, and Meyers are all nominated for at least one Primetime Emmy. I'll get back to that topic later. Donald Trump is the president, I know many people dont like him, but he does have many supporters, and people giving such a promotion about his tweeting acts is just disturbing. Spammer, the man is disturbing. Looking forward to seeing the sequel. the cv writing service comment sounds like it was translated from Russian. I am, too. I really am looking forward to an updated film to show my classes. As for the spammer, he wasn't a good example for the service being advertised. This post earned 257 default and 398 raw page views by 7:59 P.M on August 31st. This looks like a phishing scam, so I'm deleting it for the safety of my readers.